Since we launched PowerApps and Microsoft Flow about 12 months ago, we’ve been working to realize the vision of a single low code/no code app platform. These products have continued to see huge adoption from business users across small businesses and enterprises alike. Combined, PowerApps and Microsoft Flow have more than 1 million monthly active users across 213K organizations in 193 countries. At Ignite 2017 this week, we’ll showcase a set of new capabilities and integrations between PowerApps, Microsoft Flow, Office 365 and Dynamics 365 that make it easy for any business user familiar with InfoPath forms, Access databases or SharePoint to build apps that extend and automate their business processes. Below is a summary of some of the key new capabilities. Please watch the sessions at Ignite either in-person or online for a deeper look and demo about these and many more capabilities. 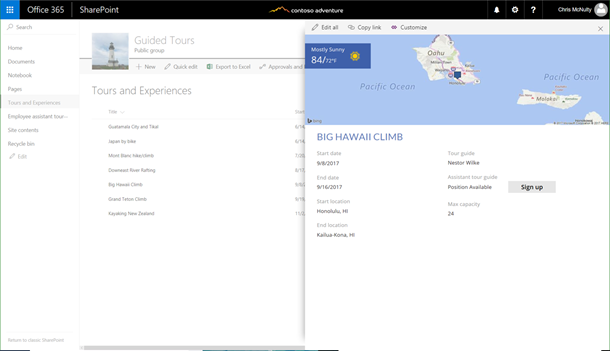 As we announced earlier this year, power users can use PowerApps to build customized SharePoint forms. PowerApps supports many of the scenarios that organizations addressed with InfoPath, and lets you take advantage of new cloud-first, mobile-first, connected capabilities to create custom forms and digital experiences to transform business processes. Almost any user can use PowerApps to customize the default forms for viewing and editing SharePoint data. The customized SharePoint forms run on web and mobile and can take advantage of the full capabilities of PowerApps – no code connectivity to over 160 data services such as Office 365, Dynamics, Salesforce, Box, Twilio, and Mail Chimp. These forms run embedded directly in SharePoint, providing a native and friction-free experience for users. We are happy to announce this experience will start rolling out in first release in October 2017, so you can use it very soon. In addition, later this year, we’ll add support in PowerApps to upload attachments into a list and to use multi-select items from a list, so you can start using these fields within your forms customized with PowerApps. PowerApps is making it easier to for more and more power users to start building apps without having to write code or formulas. We’ve recently added the ability to make your app respond to rules and conditions without writing a single formula. PowerApps Studio now automatically saves your apps so you don’t lose any work in progress. Easily set up conditional formatting with rule builder. With the latest update, PowerApps provides a point and click rule builder to express conditional logic in apps for formatting and actions. This enables the creation of sophisticated apps in less time without the need to create advanced formulas. Auto save apps. The latest update of PowerApps also adds the capability to automatically save your apps in the background. This allows makers to be focused on building apps and not worry about losing their in-progress work. Guided configuration for forms and galleries. In addition to the rule builder, we have now added a new guided configuration with a wizard-like experience for setting up forms, galleries, data tables, and other complex controls in context. As a platform for line-of-business applications, PowerApps has added more capabilities for central administration and control that modern IT teams require for enterprise-scale application delivery. PowerApps has also acquired many compliance certifications. Compliance certifications. The Business Application Platform – PowerApps, Microsoft Flow, and Power BI are now available in the Microsoft Trust Center. There, you can read about the security capabilities and see the locations where data is stored. We are happy to announce that the public attestations for our compliance certifications are now live, this includes EU Model Clauses, HIPAA/HITEC, ISO 9001, 27001 and 27018, PCI, SOC 1, 2 and 3. Richer administrative controls. Tenant admins now have more visibility into PowerApps resources and can view a list of all apps created within their organization from the PowerApps Admin Center, in addition to list of all users using PowerApps. Get detailed app analytics. 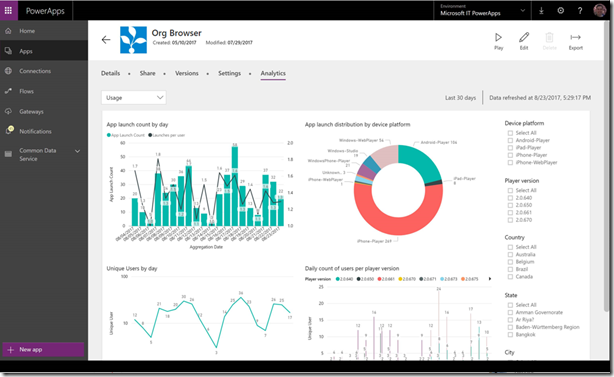 App creators and admins can now get detailed usage analytics for their applications via embedded Power BI reports, making it easy to understand app usage through PowerApps. This capability is already available in preview since earlier this month. PowerApps is expanding embedding capabilities, by enabling direct interaction with the host, which lets makers embed apps in many different solutions and websites. This lets end-users use these apps in context of the solution they are using. Embed PowerApps in SharePoint as web parts. Later this year, we’ll rollout the PowerApps web part, which enables embedding any PowerApp on any SharePoint page, in addition to embedding within list forms. This allows power users customize their business processes by using a custom-built app for users to take action right from SharePoint. Embed PowerApps in Power BI reports. Later this year, we’ll enable business analysts to embed apps built using PowerApps into Power BI reports. The app responds to filters and data selections in the report to show the right records within the app. This enables users to take actions in context of the insights they are seeing in Power BI. Server-side business logic. We are also happy to announce that we plan to add support in the Common Data Service for relationships and server-side logic by Q1 2018, enabling richer data bound apps to be built using the simplicity of PowerApps. This post only covers the key announcements. We have many more enhancements and capabilities we are showing off at Ignite, which have either shipped recently or coming very soon. With these new additions, PowerApps has taken significant strides as the business application platform of choice for organizations, along with Microsoft Flow and Power BI. Please join the conversation in the PowerApps community as we would love to hear from you about how you are using these capabilities and what you would like to see added in the future.